With the 2019 NBA Playoffs set to begin this weekend, Hotels.com has announced a special promotion that will have travellers keeping a close watch on the Houston Rockets' first-round series against the Utah Jazz. Specifically, Hotels.com wants you to keep an eye on James Harden's patented step-back. That's because Hotels.com will be giving away one free room each time Harden is called for travelling during the Rockets' post-season run. "Throughout the playoffs, anytime Harden gets called for a travel Hotels.com will give away one free room... because Harden shouldn’t be the only one allowed to travel this month." "Here’s how to shoot your shot: See The Beard get called for a travel during a playoff game? Hurry over to your Twitter and use #TravelforHotels for your chance at a free stay. It’s that easy. One winner will be chosen at random for each Harden travel throughout the Rockets’ playoff run." Harden has often been criticized for his step-back maneuver that blurs the lines between a legal gather-step and a blatant walk, but it's rare that the reigning NBA MVP is whistled for a violation. The Rockets enter the playoffs as the fourth seed in the Western Conference and will host the Utah Jazz in the first-round. Game 1, airing on TNT, is scheduled to tipoff at 9:30pm ET this Sunday, April 14. 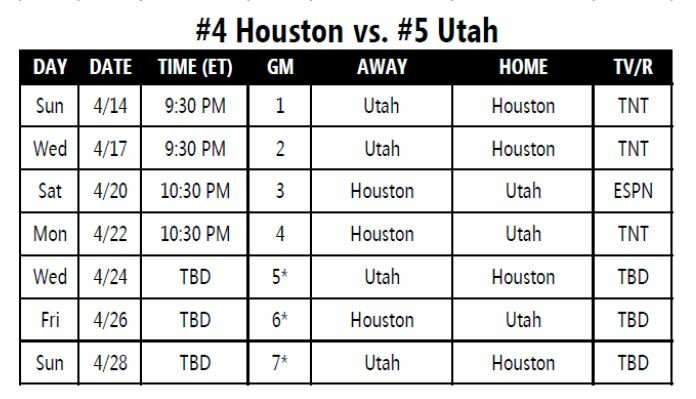 Check out the Rockets-Jazz tv schedule below, and click here for a full viewing guide of the first round matchups.